No, I did not win the lottery, although the above title usually does refer to money. But in this case I am referring to snowdrops. I was reading an English garden blog the other day and drooling over her pictures of the snowdrops in her border. Dear Reader, she had thousands. OMG! how could I possibly achieve this look in my lifetime, (ok, forget the lifetime, I want to achieve it in the next two years). She wrote that she had planted 2000 bulbs and was thinking of purchasing more “in the green”. And then Sylvia (who all Blotanists know and love) wrote a letter on Tulips In The Woods blog about her snowdrops. Now I am even more greedy! Now, every UK gardener knows what this is, but it is not common at all for North Americans. In fact, I do not even know if you can purchase them this way at all. But, you can buy snowdrops, (as well as bluebells, aconite and some crocus) “in the green” or growing. They are dug up and shipped in the spring, when they have roots and leaves. Snowdrops settle into your garden so much easier at this stage, they hate being dried out. When I was moaning to Julie about the lack of North American (at least Canadian) doing this, she was appalled. To quote, “how are you ever going to get them to grow”. But then Julie had a brilliant idea, she suggested advertising for gardeners who might be able to spare some. So if you, or you know of anyway one who would be interested in selling some snowdrops, please let me know. Obviously, they would have to be in Canada, such a headache importing from the US or overseas. I am so hoping to have (one day) the kind of show that you can see in the Rococo Garden Painswick. Ok, I have a problem. Actually, it is a serious illness. I cannot resist buying bulbs. This is only a few packages that I purchased this week (on sale, yay) and does not include the mail order bulbs that were not in pretty packages. This numbers 457 and does not include the 3 colchicums that I purchased the beginning of Sept. I am on an upward spiral, I only planted 245 in 2008, 225 in 2007 and 127 in 2006. 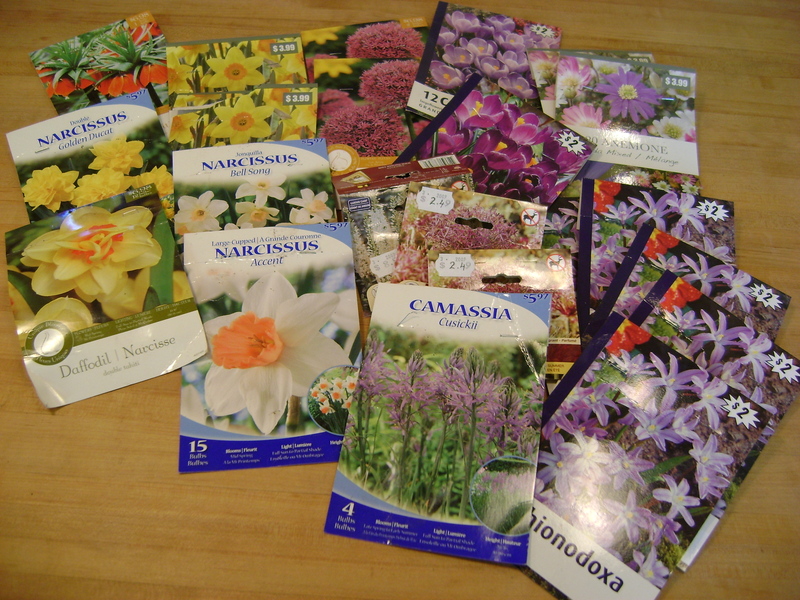 Now, these are bulbs that I paid good money for and purchased in the autumn. It does not include all the free forced bulbs that I received from work, all the bulbs that were given to me by my mum, and the very few bulbs that were here when we purchased the house. Why, oh why, when you add all these up, does it look like nothing in the garden. How many bulbs does a garden need before it starts to look full?